The black walnut tree (Juglans nigra) is an impressive hardwood tree grown in many home landscapes. Sometimes it is planted as a shade tree and other times for the wonderful nuts it produces. However, because of black walnut toxicity, some plants don’t do well when planted around the black walnut. Planting around a black walnut tree can be fatal to some plants because of black walnut toxicity, which causes an allelopathy that affects the growth of certain plants in the same area. Plants are classified as either being sensitive to the black walnut or black walnut tolerant plants. There is a specific chemical, called juglone, that occurs in the whole black walnut tree. This chemical causes black walnut toxicity in other plants which then causes sensitive plants to yellow, lose their leaves, wilt and eventually die. There are other trees that produce this chemical, such as the pecan and bitternut hickory, but they don’t produce as much of the juglone as the black walnut, making them somewhat harmless to other plants. Only the black walnut causes black walnut toxicity in other plants. There are several ways to prevent toxicity. One way (probably the easiest way) is, when planting around a black walnut tree, plant only black walnut tree compatible plants. 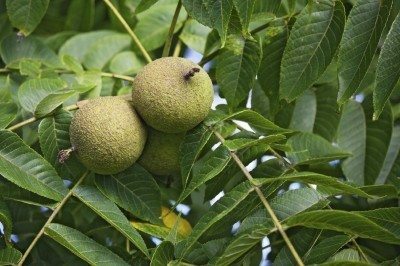 Black walnut tree compatible plants are any known plants that grow under black walnut trees without any sign of toxicity damage. Black walnut tolerant plants include the sugar maple, flowering dogwood and the boxelder to name a few. You can also plant crocuses, hyacinths and begonias. All of these plants are known to be black walnut tolerant plants. There are many more, and your local garden center can inform you of any intolerable plants so you don’t run into any problems. Another way to prevent black walnut toxicity is to construct the beds so that root penetration is not possible. If you can keep your garden or yard separated from the black walnut tree, you will save the lives of your plants. Make sure you also keep all the black walnut leaves out of your garden beds so that the leaves don’t decompose in the beds and accidentally get mixed into the soil. The black walnut tree is a beautiful tree and makes for a lovely addition to any landscape. Just make sure to follow the appropriate precautions and you can enjoy one in your yard for a long time to come! Read more articles about Black Walnut.